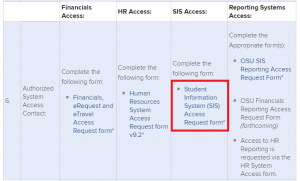 Access to OnCourse requires a request to be submitted by the person in your unit who requests SIS access. 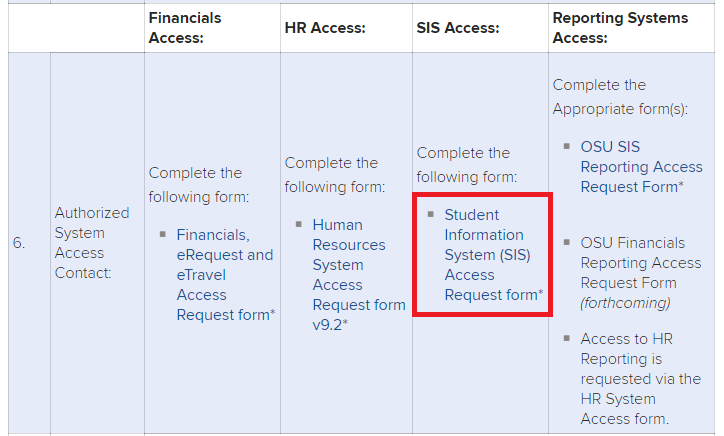 This person will need to submit a request by navigating to https://ocio.osu.edu/service-details/administrative-systems/general-information/security-workflow-and-roles and clicking on the link featured below. They will need to fill out the form with as much detail as possible, ensuring the “OnCourse box” is checked. The form will need to be forwarded to the OCIO at access@osu.edu. Before you are given access you need to complete the Institutional Data Policy training and the FERPA tutorial.